Formed a staggering 585 million years ago, Tanzanite’s discovery and entry into the market is rather recent, and yet this zoisite has taken the world by storm. Tanzanite is a fascinating and rare gemstone that can only be found in the foothills of Mount Kilimanjaro, Tanzania, the geographic origins after which the stone was named. After its discovery in 1967, Tanzanite has also become wildly popular due to its breathtakingly beautiful colour. It was only in 2002 that The American Gemstone Association attributed Tanzanite to the month of December. Where Does The Tradition Of Birthstones Come From? The formal, Western standardised birthstones were published in 1912 by The American Gemstone Association, but this was only because “traditional birthstones” varied so dramatically from place to place. Historians have found reference to birthstones as far back as the first century in Israel; the 1560s in Germany and 1800s Poland. If we travel East, Hinduism lists nine gemstones associated with the Navagraha (celestial forces including the planets, the sun, and the moon). At birth, an astrological chart is calculated, indicating certain stones should be worn on the body to ward off potential problems based on the place of these forces in the sky. Over time, December has been awarded the birthstones of Ruby, Bloodstone, Turquoise, Lapis Lazuli and finally, Tanzanite. What Are The Mythical Powers of Tanzanite? Gems have captured the imagination of man since the dawn of time, with cultures spanning across time and space attributing a variety of beliefs and superstitions to them. It’s important to state that mythology surrounding the powers of Tanzanite are just that; myths. And however fascinating, there’s no hard, scientific evidence that Tanzanite has any powers beyond staggering beauty and the ability to capture one’s imagination. The following are cultural assertions, historical beliefs and folklore. Tanzanite is said to have powerful spiritual energies that can establish a connection between your mind and the higher realms. It’s also reported that Tanzanite is a highly creative stone and will get you right back on track after being distracted or interrupted. Some people believe Tanzanite has healing powers due to its alleged ability to integrate and activate the energies. In Tanzania, women who have just given birth wear blue beads and fabric to bestow a healthy and positive life upon their newborns. This custom has been going on for generations in Tanzania. This unique gemstone was formed during the process of the regional metamorphism, and can be explained as follows: when tectonic plates collide with one another, the igneous rocks (rocks formed through the cooling and solidification of magma / lava) of each tectonic plate are morphed into one another by means of extreme pressure. The rocks reach near melting point, and when this happens, they produce beautiful crystal structures. It is during this magical time that gems are formed, essentially, from the coming together of two plates. The process in which the Tanzanite is made is thought to be so unique, that geologists believe the chances of another collection of Tanzanite being created are only about one in one million. Tanzanite can be found in different shades of blue – from a pale to deep blue with violet undertones. The gemstone is unique for its multidimensional colours. It’s also known for being the most beautiful gemstone discovered in the 20th century. The optical phenomenon, trichroism causes the Tanzanite to reflect three different colours from different angles – blue, violet and red. This is why it’s extremely important for the gemstone to be cut accordingly so that the right blue and violet hues are reflected. Tanzanite is a relatively soft stone. On the Moh’s Scale of Hardness it measures 6.5 – 7. Tanzanite earrings and pendants are suitable for everyday wear. Tanzanite rings on the other hand are better suited for special occasions and not for every day wear. There’s no denying that Tanzanite has a lot of alluring aspects. Today, Tanzanite rings and other Tanzanite jewellery creations are wildly popular. Not only do you get to purchase a unique gem, but you also get to take home a rich part of African heritage. For a true Tanzanite experience visit a Shimansky store - home to the most beautiful Tanzanite rings in South Africa. The one of a kind gemstones are sourced directly from the Maasai tribe in Tanzania. And only the very best quality gems are chosen for each Shimansky Ayanda Tanzanite jewellery creation. 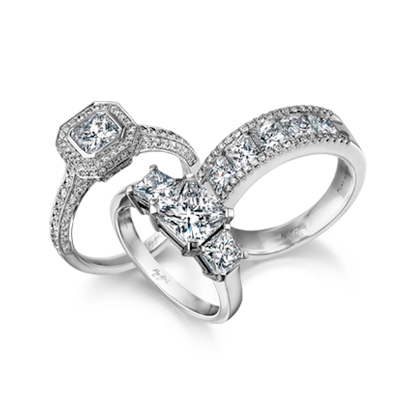 The collection comprises a variety of breathtaking rings, pendants and earrings.